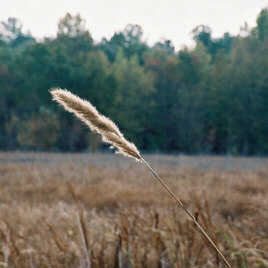 Sugarcane plume, or beard grass (Saccharum giganteum), is a large, perennial grass found in ditches, savannahs, and woodland borders throughout the coastal plain and piedmont of South Carolina. Where growing, it is visually dominant because of its substantial height (10–12 feet) and the large silvery to purplish panicles that contain its seeds, which mature during the fall. It also is a frequent colonizer of abandoned rice fields along the coast. The plume seen here was photographed at Ellenton Bay, one of the estimated 371 Carolina bays at SRS. Carolina bays are natural, shallow, elliptical depressions in the ground that collect rainwater runoff but have no natural outlet. They generally contain water for part or most of the year, depending on the season and on precipitation patterns. Many SRS Carolina bays were drained and farmed prior to the transfer of the land to the U.S. Atomic Energy Commission in the early 1950s. The 2007 SRS Environmental Report's interactive CD and associated web page were created by Marvin Stewart of the Washington Savannah River Company's Information Technology Department. The cover photograph was shot by Al Mamatey of the company’s Environmental Services Section, and the cover was designed by Eleanor Justice of the company’s Documentation and Information Services Section – Information Management and Production Support Group.